Join us at a family shelter to help families experiencing homelessness celebrate Easter! There will be food, games, arts and crafts, and lots of fun. We just need your enthusiasm! Volunteers must be at least 14 years old to participate, no exceptions please. .This event requires pre-registration as the number of spots are limited – please register in advance. Thanks! Celebrate the end of Passover the Moroccan way! 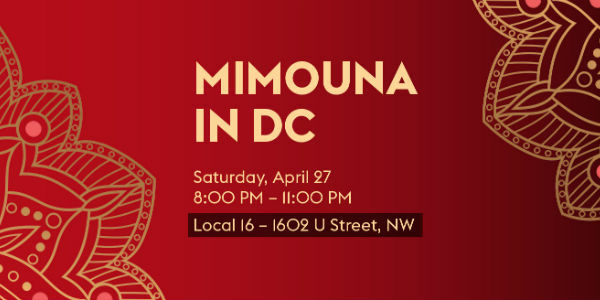 Dance to the hottest music from Tel Aviv, enjoy delicious Moroccan and Israeli sweets, take in a belly dancing performance, and get free henna – plus, drink specials all night long! Want to attend for free? Email Stacy at stacym@edcjcc.org to volunteer for a 1 hour shift. Co-presented with Israeli House, Sephardic Jews in DC, IAC, Israel Policy Forum, JScreen, and Moishe House Without Walls. Join us for part 2 of our Anacostia River series to learn more about the river’s ecological and environmental challenges, and then get in and do some cleaning up to make it safer for all to enjoy. We will meet on Kingman Island to pick up trash and debris and then take a boat tour with the Anacostia Riverkeeper staff to learn more about the river and the communities on its banks. We will provide everything you need to do the trash clean-up but please wear long pants, long sleeves, and closed-toe shoes. Please also only wear clothing you do not mind getting dirty. We recommend that you bring a water bottle, sunscreen, and a hat as well. Children of all ages are welcome but children under the age of 14 must be accompanied by an adult. If you have any questions please email Sonya. In partnership with Avodah: The Jewish Service Corps, Tzedek DC, Operation Understanding DC, Jews United for Justice, and the Capital Jewish Museum. Classes are offered Wednesday evenings in a 12-week session. Each class is one hour. Herzliya requires the textbook Hebrew From Scratch (Part 1)– you can purchase a new copy of the textbook at the time of registration. You can pick up the textbook in your classroom on your first day of class. There will be no class on May 27 for Memorial Day. We will have class on the evening of June 10, the end of the Shavuot holiday. Before registering, make sure you are familiar with the JLL Registration Policies. Click on the TICKETS button to the right to register! Join us for an information session to learn more about the Inclusion Community Service Camp. Teens of all abilities will work directly with the EDCJCC’s Morris Cafritz Center for Community Service and Inclusion & Disability professionals, making this service camp accessible to all. Service opportunities will include food preparation and distribution, shelter repair, community clean-ups, and more. Campers earn up to 30 Student Service Learning (SSL) hours per week. Transportation is available from Montgomery County. Vered HaGalil requires the textbook Hebrew From Scratch (Part 1)– you can purchase a new copy of the textbook at the time of registration. You can pick up the textbook in your classroom on your first day of class. Classes are offered Monday evenings in a 12-week session. Each class is one hour. Dimona requires the textbook Hebrew From Scratch (Part 1)– you can purchase a new copy of the textbook at the time of registration. You can pick up the textbook in your classroom on your first day of class. Mondays, April 8-July 1, 8:30-9:30 pm. There will be no class on May 27 for Memorial Day. Class will be held on June 10, the end of the Shavuot holiday. Stretch and Strength class was created to help people move through daily life with more energy, less pain, greater ease, and better focus by using techniques that release excess tension while strengthening postures that hold a body in balance. This work corrects pain-causing habits, such as slouching and pain-adaptation, aids recovery from injury, and sharpens recreational and work performance. Cost: $50 for unlimited classes monthly (You would be able to attend any or all three classes weekly) or $8.00 drop in fee per class. Aleph requires the textbook Hebrew From Scratch (Part 1)– you can purchase a new copy of the textbook at the time of registration. You can pick up the textbook in your classroom on your first day of class. Gila will be out on 4/17 and 6/26 (the scheduled last day of classes). We’ve scheduled make-up sessions for Monday 5/20 and Tuesday 6/11.